An affordable instrument for the advancing player, this violin was handmade in Romania with select Carpathian hardwoods and spruce. Its low action makes for easy playability and a sweet and smooth tone. Come into the shop Tuesday to Thursday 12-6pm, Friday 12-5pm, and Sat 1-3pm to try out this violin! What if Peeling an Orange Led to the Shape of a Violin’s F-hole? Read the blog post and check out the full article in the Strad here. On Friday May 29th, the Columbus Theater proudly presents the WHAT CHEER? BRIGADE – 10th Anniversary show! The show also features special guests PITCHBLAK BRASS BAND and DJ Pandemic Pete. The What Cheer? Brigade is a 19-piece brass band from Providence, RI, USA. We prove that great parties need no electricity. Head to Nick-a-Nee’s tonight, May 12th to see the Mighty Good Boys and Sarah Eide! Show starts at 9pm and NO COVER! The Mighty Good Boys are a rock and roll band with hefty influence of Appalachian & other folk music styles. Original material, performed electric or acoustic. A classical background coupled with a love for folk and roots music has led Sarah Eide to writing songs that are daring yet familiar. Her lyrics are all at once raw, smart and intimate, wrapped in expressive melodies and driven by adventurous chord changes. Her songs dare question aloud spirituality, morality, relationships, societal standards, and where the line lies between right and wrong. This Juzek Viola (16″) has a deep and resonant sound, cherry golden varnish, and a lovely one-piece back. Come into the shop Tuesday to Thursday 12-6pm, Friday 12-5pm, and Sat 1-3pm to try out this viola! McCarten Violins in the ProJo! Bartholomaus Traubeck is a designer in Germany who has created a modified turntable that plays what has been dubbed “the voice of the trees.” Traubeck’s design allows the player to make musical sounds from the inner rings of a tree, producing unique and varying sound textures. Though the actual sliced pieces of the tree do not have qualities of sound in piano form, the converted record player analyses the tree rings for their thickness, rate of growth and strength. It maps that data and outputs it as piano music through the stereo as captured here. Come to the second Providence Pub Sing at Nick-A-Nee’s starting at 5pm this Sunday, May 3rd. All are welcome! What is a pub sing? A gathering where people get together and sing unamplified, mostly a capella songs, that are usually easy to join in on without the need of written lyrics. Think spirituals, sea shanties, English drinking songs, camp songs, work songs, etc. All are welcome to lead songs, just sing along, or even just listen, regardless of experience/ability. Featured Instrument: $600 SPECIAL this week! Just in! A complete full size violin outfit featuring a Gliga Gems violin fitted with Knilling Perfection Planetary mechanical pegs, a wood frame shaped case, and a JTJet carbon fiber bow. Don’t miss Burning Bridget Cleary at the Blackstone River Theater tonight, Saturday April 25th at 8pm! Tickets are $16 in advance, $18 the day of the show. Check them out at www.burningbridgetcleary.com. 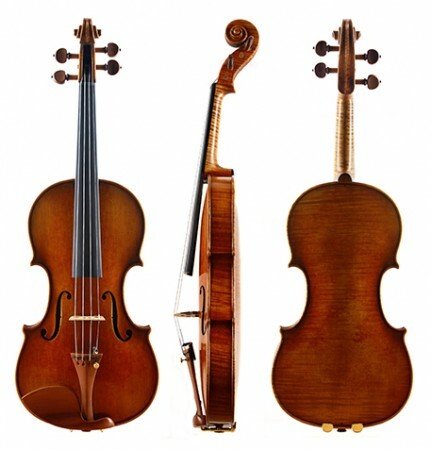 Featured Instrument: Edel Strasse Model 200 Violin! 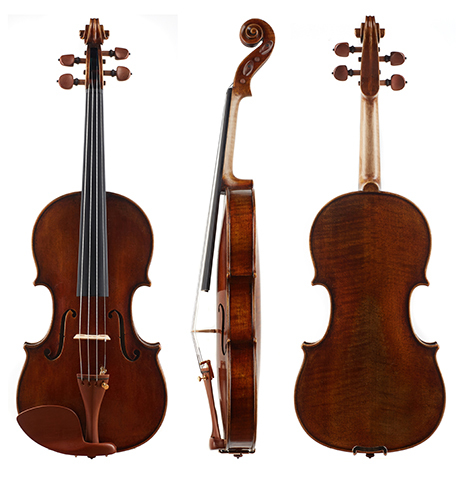 Introducing the Edel Strasse Model 200 Violin: an affordable instrument (only $629.99) for the advancing student that features a mellow, rounded tone. 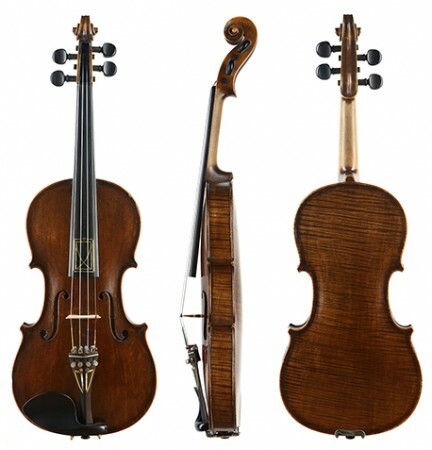 This violin is fashioned in the classic Stradivari pattern with beautifully applied and lightly antiqued brown varnish. It is finished with boxwood fittings with ebony trim. This Saturday, April 18th, celebrate Record Store Day at What Cheer? on Thayer Street in Providence! From 10am to 8pm, celebrate with Limited Edition RSD Releases and live music featuring Bob Kendall, the Red Pennys, Sleepyhead and Emma Rome. Record Store Day was conceived in 2007 at a gathering of independent record store owners and employees as a way to celebrate and spread the word about the unique culture surrounding independently owned record stores. It is a day for the people who make up the world of the record store—the staff, the customers, and the artists—to come together and celebrate the special role these stores play in their communities. Check out Record Store Day here. Filed Under: Events, Local Listening Tagged With: providence, record store day, What Cheer? Caitlín Nic Gabhann and Ciarán Ó Maonaigh. Featured Instrument: Maggini Copy Violin! This Maggini copy violin has a dark, bold sound that rings freely. This instrument is ideal for any student who loves a complex and deep sound paired with easy playability. 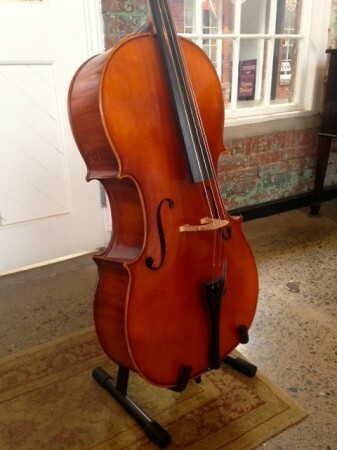 Come into the shop Tuesday to Thursday 12-6pm, Friday 12-5pm, and Sat 1-3pm to try out this cello! On April 15th, Chasing Blue will return to Nick-A-Nee’s in Providence for their weekly Bluegrass tHrOEDOWN! Formed in the fall of ’08 at Berklee College of Music in Boston, Chasing Blue plays a mix of original and traditional bluegrass material with unique arrangements and hard-driving style. Original material holds true to the bluegrass tradition but strong lyrical ideas and progressive musical ideas make the Chasing Blue sound. Community MusicWorks is a community-based organization that uses music education and performance as a vehicle to build lasting and meaningful relationships between children, families, and professional musicians. Learn more at www.communitymusicworks.org. Listen to the interview on NPR here. This Saturday, March 21st, country blues and folk musicians Martin Grosswendt and Susanne Salem-Schatz will perform at the Blackstone River Theatre, followed by Bertrand Laurence, a master of the art of country blues fingerpicking and slide guitar. Tickets are $13 in advance and $15 at the door. For more information, visit www.riverfolk.org. Martin Grosswendt has been exploring the roots and branches of American acoustic music for more than 40 years. Musicians and critics have called him, among other things, a national treasure and a rumor in his own time. In fact, a single label can’t do justice to Martin’s dynamic musical talents. An extraordinary instrumentalist and powerful singer best known as an interpreter of 1920s and ’30s blues, his mastery of numerous regional styles on guitar, mandolin, five-string banjo, and fiddle make his concerts events that audiences don’t soon forget. His performances encompass the breadth and depth of Southern roots music, from classic Delta and East Coast blues to early country music to Creole and Cajun music. 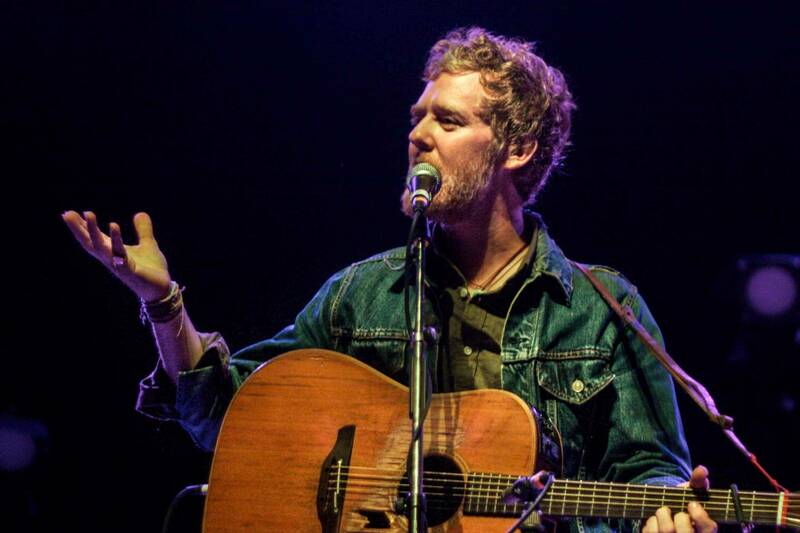 His love for a good song also moves him to perform material from such modern songwriters such as Townes Van Zandt and Richard Thompson. In addition to his teaching and solo work, Martin performs frequently as a duo with the remarkable singer Susanne Salem-Schatz who will also perform tonight. Martin plays and sings with Salem-Schatz in the Boston-based band Honky Tonk Masquerade. Bertrand Laurence plays traditional, contemporary, and original blues as well as an eclectic mix of swing tunes, jump blues, ragtime, boogie, bluesy show tunes, rockabilly,… even blues sung in French! Inspired by childhood heroes, Laurence tries to recapture in his music the exuberance of Jelly Roll Morton and the rocking guitar style of Big Bill Broonzy. Having spent a number of years as a performance artist, Laurence also knows how to put on a show and his time working at a homeless shelter also taught him the healing power of the blues. “I like to focus on the upside of the blues,” he says. “I’m into joy and celebration.” His CD, “La Vie en Bleu” shows Laurence at his best, fingerpicking his way through a diverse collection of intrumentals on six-string, twelve-string and slide guitar, and singing blues in both English and French. This full size cello is an affordable choice for any advancing student! It comes with a case and bow. 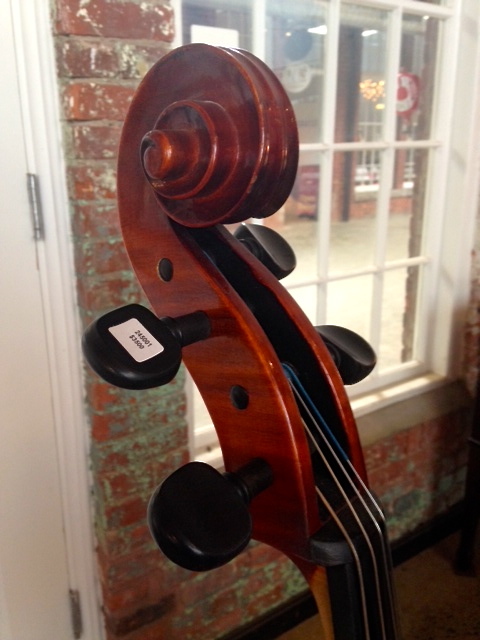 Come into the shop Tuesday to Thursday 12-6pm, Friday 12-5pm, and Sat 11-2pm to try out this cello! Come out for the 3rd annual Ham Jam this Sunday, March 15th at the Met in Pawtucket! Ham Jam was formed after a gathering of food dedicated individuals discovered they happened to share the same passion for music as they did for cooking. And thus, emerging from some of the great kitchens in Rhode Island, a music event was born. This Ham Jam will bring together four bands for one night of delicious music–from Chez Pascal, Persimmon, and Nick’s on Broadway + Mark Taber, Wade Devers and dj k-luv. Doors open at 4:30. Tickets are $5. Consider yourself a historical music buff? 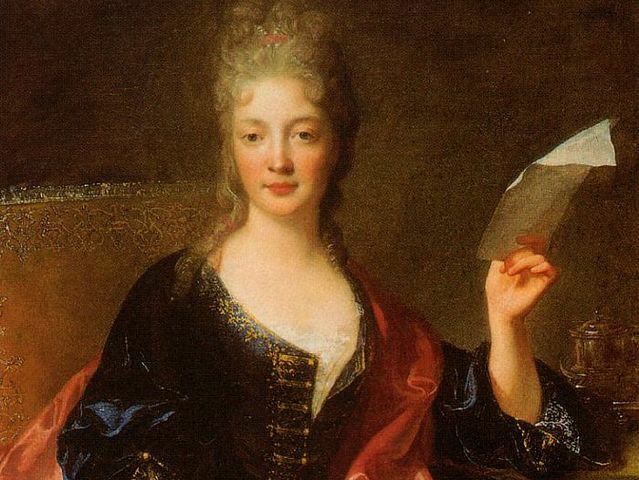 Show off (or brush up on…) your knowledge of female composers with this quiz in honor of International Women’s Day earlier this week. If you think you’re up to the challenge, check out the quiz here. On Tuesday, March 10th, crankie-makers and singers of old songs from the Virginia Mountains and Baltimore ANNA & ELIZABETH will be playing and sharing tunes at AS220 in downtown Providence. Acclaimed young ballad singer Elizabeth LaPrelle of Rural Retreat Virginia and Baltimore based fiddler Anna Roberts-Gevalt who learned to play fiddle and banjo in visits to Eastern Kentucky have shared their crankies and harmonies in country stores, living rooms, classrooms, fine art museums and concert halls across the United States, and abroad in Uzbekistan and Ireland. “There’s something truly inspiring about this collaboration between 25 year olds from southwest Virginia… culture carried forward with mastery, love and a profound and real understanding of what makes old material great,” said SING OUT MAGAZINE. Doors at 7pm, show at 7:30. For more info, visit www.annaandelizabeth.com and www.as220.org. Is perfect pitch something you are born with or something you can learn? (I hope it’s the latter…) Check out these 6 curious facts about the phenomenon here, as brought to you by CMuse. Think you share this musical talent with Mozart? You can test yourself with this video. 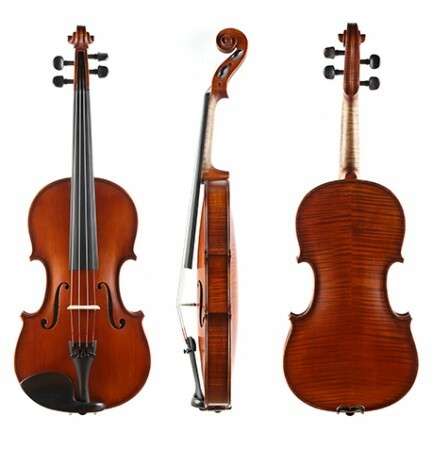 Featured Instrument: Clement Model 205 Violin! An affordable instrument for the advancing player, this violin possesses a bright, bold sound and easy playability. Warm in color, it also features a one-piece back. Come into the shop Tuesday to Thursday 12-6pm, Friday 12-5pm, and Sat 11-2pm to try out this unique violin! For Wes Anderson’s latest film, the Grand Budapest Hotel, composer Alexandre Desplat took on the task of creating the musical tradition of Zubrowka, the fictional nation that serves as a backdrop for Anderson’s vivid and imaginative plot. In an interview with NPR, Desplat explains the musical process which led to the Oscar-nominated score. Listen in and read the article here. On February 25th, composer Philip Glass and violinist Tim Fain will perform at the Vets Auditorium. This chamber music concert will feature works from across Glass’ career, including compositions written specifically for Fain, one of the few soloists for whom Glass has composed solo material. The concert begins at 7:30pm; tickets and more information are available here. In honor of everyone’s favorite (or least favorite) heart-filled holiday, NPR asked its listeners to send in their favorite romantic song. On this week’s All Songs Considered, they share and discuss the results. Number 1? “First Day of My Life,” by Bright Eyes. My personal pick, however, would be “Careless Love” as sung by Ray Charles and Madeleine Peyroux. View the full list and listen in here.